Leave the car behind, forget about traffic, and plan your next meal at one of the great waterfront restaurants in Destin. One of the best things to do in Destin is find local restaurants located on the water for a memorable dining experience. If you have a pontoon boat rental, you can dock at these eateries and enjoy fresh seafood just a few steps away. Arriving to a restaurant by boat is a unique experience that is definitely a cool Floridian thing to try while on vacation. These are some of the top waterfront restaurants in Destin. If you're looking for the whole waterfront dining experience, complete with a number of fellow patrons who arrive by boat, then Boshamps Seafood & Oyster Bar is definitely the right pick. Located on the beautiful Destin harbor, you’ll enjoy fabulous food in a relaxed and casual environment. There's an enormous outdoor seating area as well as fun games and a volleyball court where you can have a blast. Even in the winter, a fire pit draws in boaters in search of a little extra warmth. Great seafood and plenty of drinks await you at Boshamps Oyster Bar. Lulu's is owned by Lucy Buffet, the sister of singer Jimmy Buffet. That in and of itself is enough of a reason to visit for music lovers, but Lulu's also offers an amazing view of the water and a fun atmosphere. The menu ranges from starters to sweets and, of course, there are a few versions of cheeseburgers in paradise. There is also an allergy menu for those in your group who might suffer from food allergies or intolerances. Anchor your pontoon boat and walk right up. Just wade up on the sand to Lulu's, order one of their world-famous daiquiris, and get ready for a fantastic time. The original Dewey Destin's on the bay is a longtime favorite of locals. This is in part because of its convenient location right off of Crab Island, making it the perfect spot after a day on the water. Dewey Destin's offer casual picnic tables and a chalkboard menu featuring an array of fresh seafood. Wear your bathing suit and don't worry about getting sand anywhere, because this is a very relaxed place to dine in Destin. There is a second location located on the Destin Harbor, but it does not have direct access by boat. Note that the tide can be very strong docking at Dewey Destin’s on the bay. It’s best to dock with your boat pointing into the tide so you maintain the greatest control. With a beautiful view of Destin Harbor, Harbor Docks is one of the more established, historic waterfront restaurants in Destin. The docks are convenient to the restaurant and provide easy access for boaters. You'll have the choice of dining indoors or outside. At Harbor Docks, the menu heavily features fresh seafood right out of the Gulf. While there are plenty of classic favorites like fried shrimp, there is also an emphasis on healthier fare. Try grilled fish or delicious sushi made with seafood caught that very day. 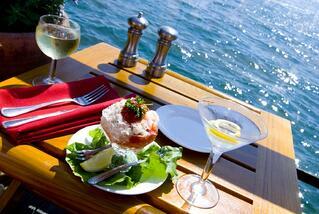 Most waterfront restaurants in Destin that you can access by boat are very relaxed eateries. However, some have a slightly more upscale vibe, and Louisiana Lagniappe is just one example. Located in Sandpiper Cove on Destin Harbor, this restaurant offers fine dining with water views. The food has a Cajun twist, with plenty of inspiration from New Orleans. Louisiana Lagniappe is only open for dinner, or late afternoon snacks at happy hour, and it can be a very impressive meal to enjoy with your nearest and dearest. If you want to visit the top waterfront restaurants in Destin on your next vacation, then make sure you have a great boat to get you there. At Double Fun Watersports, we can match you with the perfect pontoon boat rental for your time in Destin.